We are on a tight budget. Very tight because I’m now in, what I call “cheap or free” mode. I am turning it into a game so I don’t feel poor and I know that there is a pot of gold at the end of this rainbow. We have a goal of buying a house and this dream is a great motivator to get our finances in order and start saving again. Buuuttttt….I still want a life. I have my two little boys and we live in a tiny fairy cottage of 800 square feet. Surprisingly, we really have a good time in this little home and the little yard. We are very fortunate to have a wonderful, big, yellow library with a rose garden and a huge fort like playground that we can walk to. We have at least 4 great kiddie parks we can walk to along with stores and a trail. We are so lucky. We have found other ways to have fun also and I go into that in other blogs and my book Queen of Penny Pinching. However, the other day I woke up and the first thought was of my old and beloved coastal town of Fort Bragg where we moved from 3 years ago. My heart still aches for that town…I actually feel a tear welling as I write this. My very first thought was, “I must go to the Sea!” and my heart ached as a vision of my old town swaddled in fog came up within my mind’s eye. I’m dramatic like that. So, that was my dream. How to afford this trip was my challenge. I’m into saving and paying off a couple little debts right now but my husband is passionate about it. I spent five minutes strategizing ways to approach Bali and get him in the same boat, so to speak. As I entered the kitchen I just threw out the speech and announced that the boys and I were going to the coast because, although I support us building a financial future, we needed to live a little. I actually stole this argument from a friend that convinced her husband to skip the bathroom remodel for a trip to Hawaii. Living a little sounds divine and I can back it. It also puts a little guilt in the opponents direction. Wink, wink. Then, to be fair because I’m all about being fair, I added a budget proposal. The last time I went to the coast I had decided to live large and withdrew $800 out of savings. I stayed in a great Inn that my girlfriend was currently the Inn Keeper. The boys and I ate out for every single meal and we purchased all our snacks and green juices at the local health food store. So, I understood the panic in his eyes. This time we would stay with a friend and her children for free. They are on a strict and fixed income so I will bring the majority of the groceries for her family and mine and we will do all our cooking and eating from her kitchen. Community cooking, got to love that! I will shop here at Winco for all the goods and we will stick with whole chickens, rice, beans, tortillas, eggs, and peanut butter and jelly sandwiches along with oranges and apples. That should feed all 7 of us for 3 days. So, the groceries will amount to maybe $50 and then a tank of gas there and back will be a total of $80. A 3 day trip to the coast has gone from $800 down to $130! Shazam! As for entertainment; we have Halloween in that town and it is fun there. That’s free. We will be going to church and some night church activities and that’s free. Every day at the beach is free. I walk on the Big River Trail, an old logging trail through the forest is free. And all this is so beautiful and joy producing. Not to mention the negative ions from the ocean itself that will balance my poor inland soul. My challenges in this game of frugality and thrift are finding ways to save the MOST money and still do the things we love and NOT feel deprived. There are so many things you can do for free, however, there are times we want to really, really do things that aren’t free. Just like sometimes we want foods that aren’t healthy. So, what you do is find alternatives that are less expensive, alternatives that are less unhealthy. I will report back how it all panned out. I’m finding that I’m spending less money than I budget for and that’s great. The Universe is really supporting me in my endeavors this time. There are times in the past that I’ve decided to go on money saving missions and it seemed that my life became this leaky boat of money needs. This time we have been blessed often with freebies and gifts to help us along. That is the importance of turning the frugal living into a game and not a feeling of being poor. You want to see just how much life and fun you can have for little to nothing. Good luck and many blessings to you all! 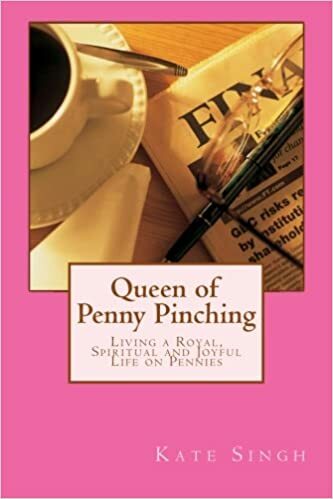 Here is a link to my fabulous Queen of Penny Pinching. I have many more frugal books for homemakers. Check out my author’s page on amazon. Previous Some inspiring stories on manifesting. Next Making do with what we have. I bet you have some great traveling on a budget advice.